China’s economy, like Wuhan’s, is in much better shape than was the case in late 2015. Then, the country was reeling from a stockmarket crash, suffering from capital outflows and accumulating debt at an alarming rate. But figures reported on April 17th showed growth of 6.8% in the first three months of 2018 compared with the same period a year earlier. In nominal terms growth was above 10%. 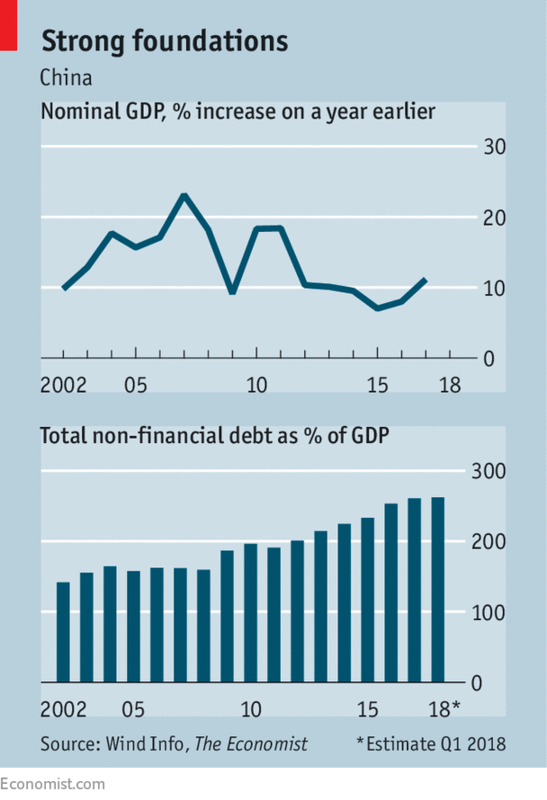 China’s total debt-to-GDP ratio has stabilised, a sign that the risk of financial crisis has receded (see chart). In the financial sector, regulators have taken aim at banks’ murky off-balance-sheet loans, and at heavily indebted borrowers such as property developers. Wang Tao of UBS, a Swiss bank, notes that these efforts have given investors more confidence. Chinese shares listed in Hong Kong have risen in value by a third over the past two years. The government has also helped arrange behind-the-scenes rescues of troubled firms. Wuhan featured one of these. The big local steel company, bleeding cash, merged with its much stronger counterpart in Shanghai in 2016. The combined entity is profitable. A second factor is that China’s economy is maturing. Growth is bound to slow over time as China gets richer, but structural changes are also making growth more stable. Thanks in part to a falling working-age population, which peaked in 2011, incomes are growing more quickly than the economy is. This, in turn, is rebalancing the economy. Excessive reliance on investment is giving way to consumption. And heavy industry is giving way to services, which now account for more than half of GDP, up from a third two decades ago. At the same time, China is reaping returns on some big investments of the past decade, such as high-speed rail in densely populated areas. Qin Zunwen, a government economist in Wuhan, says that although local debt shot up, it was almost all tied to the construction of infrastructure—half a dozen subway lines, bridges spanning the Yangtze River, elevated expressways—that is now being used. “Yes, it’s much more than we had in the past. Has it exceeded our needs? No,” he says. The final factor has been good luck. Robust growth in America and Europe has given Chinese firms a lift. After falling in 2016, exports have rebounded. The rise in global commodity prices has filtered into stronger industrial revenues in China, boosting miners and metal producers. That has helped them service their debts. And it has made the task of deleveraging for the broader economy less daunting. China has curbed outflows of hot money by tightening capital controls. It has also benefited from a weak dollar since the start of 2017, which has made the yuan more appealing. China’s coming few quarters are likely to be bumpier, however. The biggest immediate worry is President Donald Trump. The American administration has announced tariffs on about $ 50bn of Chinese exports and may soon triple that. Exports to America are only a fraction of Chinese GDP, but a trade war between the world’s two biggest economies could wreak havoc on sentiment and supply chains.